Virtual reality is hard to escape these days. Whether it be the high-end headsets, or the easier to access ones you can find for sale in supermarkets, there’s a growing presence for the technology no matter where you turn. It can seem overwhelming considering all the options on the market, especially when it comes to the high end of things. The constant fighting between Oculus and HTC, alongside the Playstation’s offering and even some of the growing mobile options can make it seem very cluttered, and a lot of conflicting information has risen. Regardless of if you’d be more interested in hiring virtual reality over paying outright, or are at least looking to get savvy about the options on the market, here’s a small guide to some of the best options on the market to help clear through the fog. To begin with, let’s clarify what Virtual reality, or VR, actually is. Virtual reality is a term used to describe a three-dimensional environment that is created by a computer. This is then made explorable by a user thanks to the use of a VR headset, setting that person into the world they view around them. Levels of interactivity vary, but most of the higher end models of VR headsets boast this as a prime feature, primarily to appeal to the gaming demographic. Other industries have found ample use for such features, however. With that simple definition out of the way, let’s look to the big three contenders on the market. If there is one company that truly helped bring VR back into the mainstream, and helped solidify its place in the tech world, it’s Oculus. Whilst their offering is far from the original, as development on VR technology goes back quite some time, it is the first to have true mainstream success. Like most options, it uses OLEDs for the image, and comes with a resolution of 2160×1200. It has its own platform with Oculus Home, thanks to a deal with Facebook, and has a 5×5 or 8×8 tracking area depending on surrounding sensors used. Controls wise, it is compatible with the Xbox One controller and the Oculus Touch, and uses an accelerometer, gyroscope, magnetometer, Constellation tracking camera to keep tabs on player movement. It requires quite a few ports to work fully, needing 2x USB 3.0 ports, a compatible HDMI, and also 8GB of RAM before it can really get to work. One other upside compared to the competitors is the price. Whilst hardly a cheap option, the Rift comes in at £499.99, undercutting others available by a considerable margin. The flipside? It needs a stronger computer rig to fully work. Recently, Oculus has announced an upgraded version of the headset, known as the Oculus Santa Cruz. Its biggest feature? Wireless. As of now the company is being somewhat quiet about the nitty gritty details, but we know it features a head mounted computer and camera array. The other big name in the field of VR headsets, HTC has come into the market and taken it by storm. Thanks to their partnership with the popular media platform Steam, they have carved themselves a sizable chunk and a loyal fanbase. Not too surprising when you look at the specifications. It uses OLEDs, has a refresh rate of 90Hz and a resolution of 2160 x 1200, just like the Rift. It even shares a similar field of view at 110 degrees. What makes it stand out is the field of view, boasting 15×15 feet and the ability to use any PC compatible controller with it. Other strengths are the requirements to run it. The Vive only needs 4GB of RAM and one USB 2.0 slot to fully show itself off. It also boasts an accelerometer, gyroscope, an in-house Lighthouse laser tracking system and a front-facing camera to help track movement, and has a crisper and cleaner image compared to the Rift thanks to less of the screen door effect on the screen. The biggest issue for most with HTC’s offering is the price. 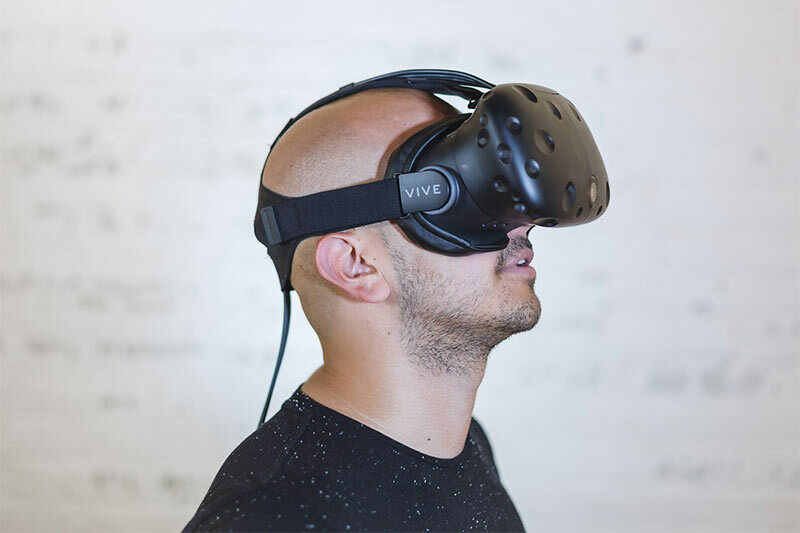 Whilst the computer needed to run it can be less beefy than needed for Oculus’ headset, the Vive is a heavier hit to the wallet with a starting price of £759. Just like with the Oculus, HTC have also announced a wireless version of their headset. Or, rather, an upgrade pack that costs about £320. Clipping this onto the existing headset gives a one-to-one experience like being connected to a PC without cables getting in the way. The only drawback is battery life: 2 hours is not the best, though for VR standards it is still quite impressive. It would be remiss to talk about VR without mentioning Sony’s offering to the field. The Playstation VR headset is a stylish and sleek option that offers one big advantage over the PC solutions: It’s much easier to set up. Starting at £239.99, and requiring a Playstation 4 to use, it boasts some impressive technical brunt for its size. Like the other options, it uses OLED with a small added RGB element, and has a resolution of 960 × RGB × 1080 per eye. The field of view is approximately 100 degrees, and it tracks movement with a combination of a magnetometer, accelerometer, gyroscope, and curiously also needs the PlayStation Eye tracking system. It connects with HDMI and a USB cable alone, and comes with bundled ear buds. Interactivity is handled by the Dual Shock or PS Move controllers. Of course with this strength comes its limitations. It is exclusively useable with a Playstation 4, which comes with all the steps and jumps through Sony’s development hoops to create content for. Still, once done the content is very consistent, and the vetting does provide a good level of overall quality. Right off the bat, the Playstation VR suffers from the most limitations when it comes to marketing. Whilst it is easy to set up compared to the Oculus and the HTC, the console locked compatibility makes it a harder experience to adapt into the marketing scene. On the other hand, both the HTC Vive and the Oculus Rift are only locked right now by the length of the cables connecting them to a computer. The defining point between the two is price and clarity of picture. The Rift tends to be a cheaper option, especially with development kits floating around for reasonable prices, but the Vive offers a much sharper image with less of the screen door effect that plagues this generation of VR options, and also has a less strenuous entry cost for running the device on PC. One thing to look for would be coupons, like a GameStop discount code that can lower the price of your purchase. Ultimately, the decision comes down to a matter of choice. Both are solid options, but one prefers performance, whilst the other is more economical. HTC and Oculus are still the trailblazers in true VR headset development, however, and with the wireless upgrades hitting the market this is only set to remain the case for the foreseeable future.